Canberra has flexed its premiership muscle and jumped to third place on the NRL ladder with a 54-4 flogging of South Sydney at Sydney's Olympic stadium. The Raiders ran in 10 tries to one on Sunday afternoon to notch their fifth-straight win, leaping over North Queensland and cementing their reputation as title contenders. The game was pretty much over by half-time after Jordan Rapana and Joey Leilua went on a rampage down the right side to make it 26-0. Rapana had a hand in four of the Raiders' five first-half tries, offloading for Elliott Whitehead's opener, scooting out of dummy-half for the next and diving on a Leilua grubber on the stroke of half-time for his second. The 26-year-old winger sent a message to Kiwi coach Stephen Kearney as he notched his 14th try of the year. As well as his double, he finished with two try assists, three linebreaks and six tackle busts. The victory was the Raiders' biggest-ever win over the Rabbitohs, surpassing their 48-0 win at the SFS in 1990. The Rabbitohs were dreadful, handing over the ball cheaply inside their own 20m zone on several occasions and coming up with costly errors that led directly to points. Five-eighth Luke Keary may have played his last game for the club after suffering a hamstring injury in the 11th minute and not returning to the field. The game was summed up seven minutes into the second half when the Rabbitohs' John Sutton dropped the ball cold and Jack Wighton ran 40m untouched to make it 32-0. 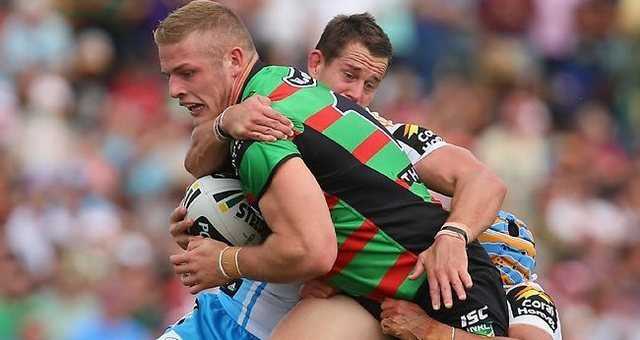 The loss was the Rabbitohs' eighth loss in a row and will heap pressure on coach Michael Maguire. The Rabbitohs scored a consolation try through Sutton, with the home side's only points coming in the 55th minute.